The purpose of this research is to review engine performance and technology issues relating to generating electricity from digester gas in reciprocating internal combustion engines. Research performed at the Colorado State University (CSU) Engines & Energy Conversion Laboratory (EECL) and published material from other organizations is utilized. Digester gas (digas) can be used effectively in internal combustion engines for electricity production to offset operating costs and/or sell to the electric utility. Stationary industrial engines are generally employed for this purpose. Four application areas where systems have been successfully demonstrated are sewage processing plants, animal waste facilities, landfills, and agricultural waste processing systems. Digas is generated through anaerobic digestion, or biomethanization, for all these cases. There are many common engine technical issues within these areas, although the digas generation systems employed in each case are different. In this presentation issues pertinent to running engines on digas are explored. The focus is on animal waste facilities, but the presentation draws upon the other application areas for technical insight related to engine technology. Specific stationary engine types are discussed. High engine efficiency and power density are important to the economic viability of anaerobic digestion systems. Engine operational and design changes to maintain high efficiency and power density for digas fueling are analyzed. Management of engine maintenance problems is also key to economic viability. Corrosive gases contained in digas, such as hydrogen sulfide (H2S), are evaluated. Figure 1 Methane number measurement of various gaseous fuels. The term biogas is a broad term encompassing both digas and producer, or wood, gas. These gases are very different in their combustion properties. Producer gas is generated in a gasifier by oxidizing biomass in an oxygen-starved environment. Producer gas contains high concentrations of hydrogen (H2) and carbon monoxide (CO), a small concentration of methane (CH4), and high diluent concentrations (CO2 and N2). In contrast digas is primarily CH4 (50-80%) and CO2 (20-50%). One of the main property differences between digas and producer gas is the methane number, which is indicative of the tendency of the fuel to knock. 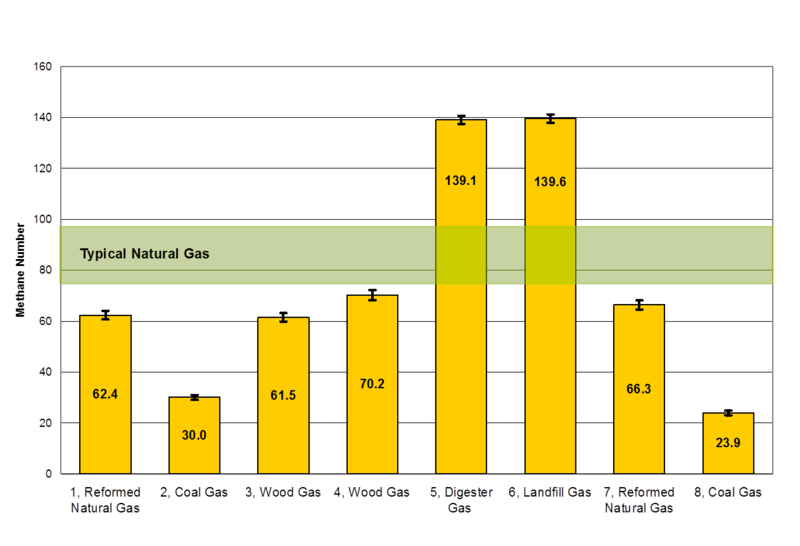 Figure 1 shows methane number measurements of various gaseous fuels made at the CSU EECL. Note that producer gas (wood gas on plot) has a methane number from 60-70, while digas gas has a methane number of almost 140. Consequently, digas is much less likely to knock than producer gas and can be operated with higher compression ratios and higher power densities. Digas is also more knock resistant than natural gas. Figure 2 Guascor SFGLD-240, rated at 330 kWe at 1200 rpm on 500-600 Btu/SCF digas. There are three different types of stationary engines that can be used to generate electricity from digas, which are (1) compression ignition (diesel) engines, (2) spark ignition stoichiometric engines, and (3) spark ignited lean-burn engines. Diesel engines (1) are employed by fumigating the intake air with digas. The amount of diesel used is reduced as more digas is added, resulting in dual fuel operation. Limitations on diesel displacement and the necessity of storing two different fuels are drawbacks of this approach. Spark ignition stoichiometric engines have similar operating characteristics to most automotive engines in the United States. They utilize NSCR, or 3-way, catalysts for emissions reduction that required precise air/fuel ratio control. Lean-burn natural gas engines are more efficient than stoichiometric engines and can achieve low emissions without exhaust aftertreatment. Thus, option (3) is the most desirable; it is the approach typically implemented for digas utilization in most large installations. Figure 2 shows a Guascor SFGLD-240 installation by Martin Machinery. 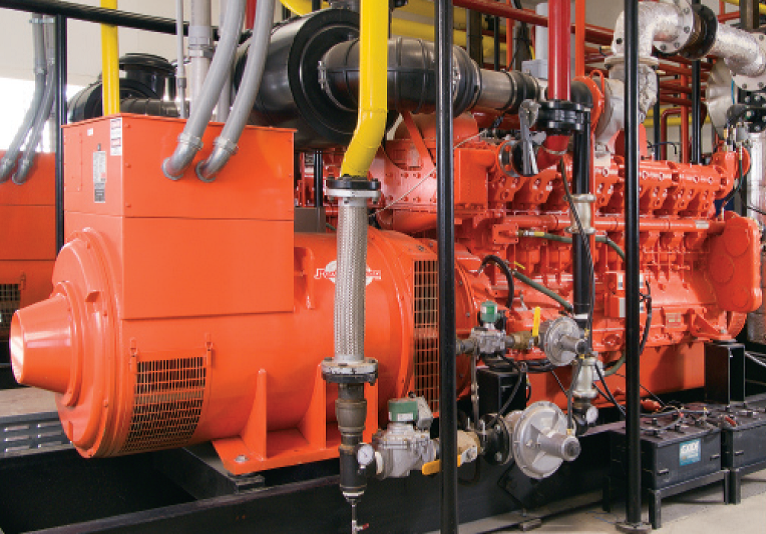 Lean-burn natural gas engines can be used without modification for digas installations. However, in this case the engines typically are de-rated, require additional maintenance, and suffer from reduced engine life. Some engine manufacturers offer engines specifically designed for digas, which has several advantages. Digas has unique properties that necessitate design changes to natural gas engines to achieve rated power and minimize maintenance costs. To maintain rated power the flow capacity of the fuel system must be increased, since the energy content of digas is approximately 60% that of natural gas. This is due to the high concentration of CO2 diluent. Other operational changes often made are advanced timing due to slower combustion and richer equivalence ratio. To maintain the same NOx level the equivalence ratio is richer because the diluent in the fuel reduces combustion temperatures. Though not typically done, higher compression ratio pistons can be added to take advantage of the higher methane number of digas, which results in improved efficiency. Corrosion resistant materials and improved crankcase ventilation are design changes often made to combat the effects of corrosive contaminants in the fuel. Digas can contain trace levels of gases other than CH4 and CO2 such as hydrogen, carbon monoxide, nitrogen, oxygen, ammonia (NH3) and H2S. Digas H2S levels from hog and cattle digesters of ~2000-5000 ppm are typical. These levels are above engine manufacturer H2S limits (250-1000 ppm). H2S must be reduced below the respective engine manufacturer limit if the engine warrantee is to be valid. When sulfur compounds are combined with water, acids are produced in the engine oil. These acids attack the metals in the engine, causing corrosive wear. Scrubbers can be used to reduce H2S in the fuel below manufacturer limits. Two commercially available H2S scrubber technologies are iron oxides and bio-trickling. H2S reacts with the iron oxide to form insoluble iron sulfides. The material can be regenerated with air to produce pure sulfur. Iron sulfides and/or pure sulfur must be disposed of. Bio-trickling involves a filter media that provides an environment for establishment of a bacteria biofilm. The H2S comes in contact with the biofilm, is solubilized, and subsequently oxidized by the microbes. Sulfur and sulfate compounds are formed as by-products and purged with recirculating water. The by-products are collected and disposed of. Bio-trickling requires more expertise to set up, but requires less maintenance long term. Malenshek M., Olsen D.B., “Methane number testing of alternative gaseous fuels”, Fuel, Volume 88, pp. 650-656, 2009. Caterpillar Inc. publication, October 2008. Reinbold, E. and von der Ehe, James, “Development of the Dresser Waukesha 16V150LTD Engine for Bio-Gas Fuels”, ASME Internal Combustion Engine Division 2009 Spring Technical Conference, ICES2009-76079, May 3-6, 2009. Guascor Power, “Anaerobic Digestion Gas Fuel Specifications – Landfill and Digester Gas”, Product Information IC-G-D-30-003e, Sept 2011. Steven McKinsey Zicari, “Removal of Hydrogen Sulfide from Biogas Using Cow-Manure Compost”, MS Thesis, Cornell University, 2003. Personal Communications, 1-10-2013, Marcus Martin, Martin Machinery LLC.